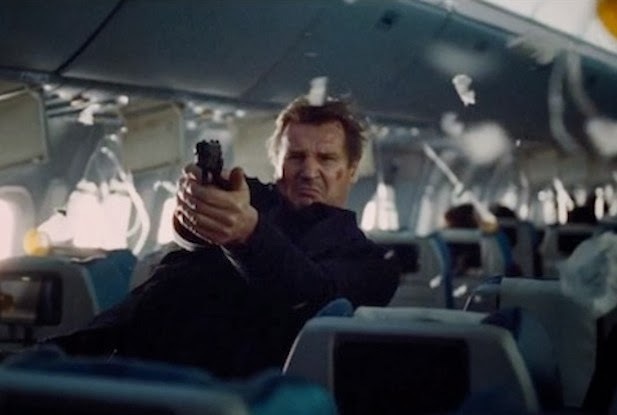 Liam Neeson leads the way as being the best of the more mature action stars. He is tall, formidable, and totally convincing as a man totally in control of his world. Playing an alcoholic U.S. Air Marshall depressed over the loss of his daughter to cancer, he must save the passengers on a six hour flight to London from unknown terrorists. The script by John W. Richardson, Chris Roach and Ryan Engle is brought to life by director Jaume Collet-Serra in this French/American production from Joel Silver. As long as you just go with the tense and unrelenting action and don't think about the plot holes, you will have good time. The transatlantic flight from New York to London is seen through the bleary eyes of Bill Marks who was drinking in his car and smoking cigarettes like a chimney just before his before going into the airport. He peruses the passengers waiting to board the plane assessing everyone for potential problems. There's Jen (Julianne Moore) who manages to switch seats with Bill's row mate Zach (Nate Parker) because she wants to sit by a window, there's a little girl Becca (Quinn McColgan) who is flying alone on the way to see her father, and Nancy (Michelle Dockery) the stewardess for first class who knows not to serve Bill a cocktail. Bill starts getting text messages on his secure Air Marshall phone. The caller tells him that in 20 minutes someone will die unless 150 million is transferred into an account. He tells another agent on board, Jack (Anson Mount) who would raise anyone's hackles as being just suspicious from the get go especially when he tells Bill to not take it seriously. Of course, he informs the pilot (Linus Roache) and they begin to follow the standard procedures which would mean putting a dead zone on all electronics on the plane. But Bill wants to keep it on to track which of the passengers may be sending the messages. Things start to move along quickly as Bill's bosses inform him that the bank account for which the ransom money was to be sent is in his name. Soon he's the main suspect and his drinking and bad rep are working against him. Who can he trust, how can he catch the bad guy? The rest of the movie is tense, non-stop action, and no one is above suspicion. Bill really wants to have another drink, and he's smoking cigarettes on the plane's bathrooms covering up the smoke detectors with duct tape which he carries with him. The messages keep coming, the bodies count accumulates, and everyone thinks Bill is culprit. What's a guy to do? Neeson does a serviceable job as the man on the edge trying to get to the terrorists while scaring the bejeesus out the passengers. Everything moves quickly so the you can't think about details too closely. The viewer is impressed with Bill's point of view and it's worth the ride. Just go have lunch afterwards and don't worry about the small stuff.